A few weeks later they were out hunting together again and Van looked at Robert and said..
Two weeks later the first Ballindenisk event happened. The building of the cross country course was very different to what happens now. It was built at night with the aid of tractor lights up to the night before the competition. The first 3 day Event happened in October 1977 even bringing International riders. 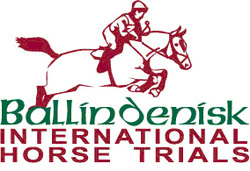 Here are some funny stories about the first 3 day in Ballindenisk. Robert was asked to measure the cross country course but was never told how to do it, so he started at fence 1 and proceeded to wheel the course going in a straight line from fence to fence, so everyone got cricket time faults!!!! On the Sunday morning at 6 am a phone call came through to the house, to say that there was an urgent telegram in the post office for Ian Duncan...(in the lead going into show jumping)... So Ian's father jumped into his car in a mad panic to get the telegram, to find it was from Ian's girlfriend wishing him good luck... As you can imagine Ian's father was not too pleased about it.